How to succefuly complete this? After opening the RPC debug menu, you can do getrawtransaction e9c858f852a1de7c70e6f8377f2147f3def1d4b1d85a5947d028bb9c13450318, and then paste the raw hex transaction to https://www.blockchain.com/btc/pushtx. Not the answer you're looking for? Browse other questions tagged bitcoin-core unconfirmed-transactions error or ask your own question. Why getrawtransaction returns an HTTP STATUS CODE 500 for not found transactions? How do you choose the correct fee with Bitcoin Core? Transaction created with sendtoaddress didn't propagate to the network, how to resend? 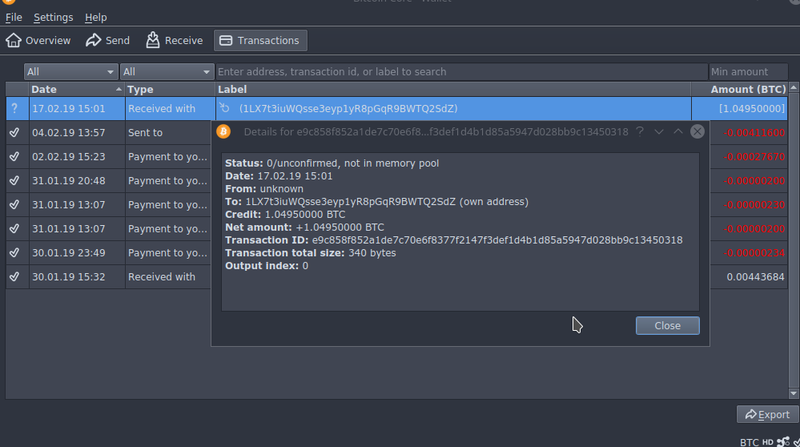 Unconfirmed transaction - now can't be found! How to confirm that a bitcoin transaction is confirmed and success?